Poem 65 I love, but there will still need to be more editing, the end is a little flat and the delivery, though better than before, could be whittled a bit more. 1 – be more organized and diligent about revising in the moment and not waiting until the assignment or the book is due. 2 – take the time to gather all of the drafts so that changes could be tracked and I could maybe go back if I got stuck. There was something desperate and fast about college poetry classes. Most of them had only a few assignments, so when push came to shove I stalled them to be more studious in classes like science – ugh. As a result there was a rush at the end. Not only were there all sorts of papers with all kinds of hand written notes but there was no time to collect them together. When we were at the end of a deadline I was more inclined to just turn out the best poem I could as it was, so inevitably, the versions were lost. All that feedback, all that middle drafting, just gone. What a shame. If I could go back I would always have saved them, maybe scanned them, maybe made notes on all the suggestions. This poem was a class workshop poem, an assignment poem, a submission poem, so the feedback was diverse and well thought out, and now it is lost to the universe, hopefully I recycled it. That doesn’t make this version any better or worse than it might have been. Nothing is lost that is not regained eventually, as an artist I believe this with all of my heart. This is just less pensive. Less thought out, less considered. 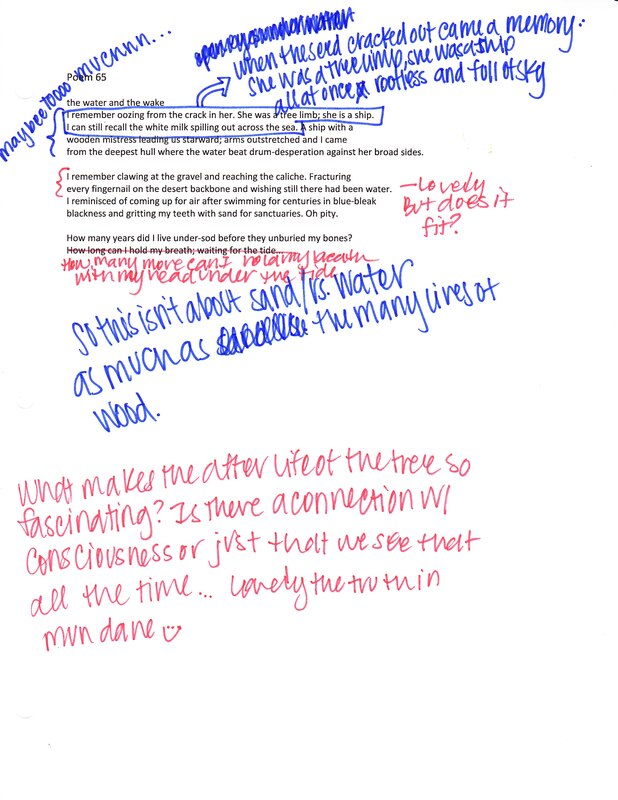 As a poet of process I like the idea of feedback and connected drafting. For me, this poem feels a little like the progression of humans over time. All these missing links and no way to really reconnect them, only thoughts and ideas on what might have been between. Poems with lots and lots of drafts have a more complicated process that might bet lost if organization is not a priority. For me, the lost drafts are a casualty of my former messiness. For now, the poem is better than ever despite any lost versions. The poem will be whatever it wants to be eventually, as long as we all keep editing, those drafts will be a shame but not a tragedy.